The AIUB Journal of Business and Economics [AJBE] is going to start the second volume with the current issue – the sixth consecutive issue in the hi story of AIUB since January 2002. In celebration of this grand occasion, the editorial board of AJBE has decided to publish the Address of H.E. Mr. Fidel Valdez Ramos, Former President of the Republic of Philippines; and Chairman of the Ramos Peace and development Foundation [RPDEV] and the Boao Forum for Asia [BFA], at the 4th Convocation ceremony of the American International University – Bangladesh [AIUB] held at the Bangladesh-China Friendship Convention Center, Dhaka, on 10 January 2004. H.E. Mr. F. V. Ramos delivered the speech with a theme of “knowledge economy” as the Convocation Speaker in the ceremony. As the Vice-Chancellor of AIUB, I thank him for delivering a wonderful address to the graduating students in presence of their guardians, dignitaries representing various government and non-government bodies and from foreign diplomatic missions as well as, most importantly, the kind presence of the President of the People’s Republic of Bangladesh, Dr. Iazuddin Ahmed, as the Chancellor of AIUB. Frameworks are a useful way to enable object-oriented reuse, but their size and complexity makes understanding how to use them difficult. Different people have proposed different ways to document frameworks, but it was unclear which ones actually were better. This study empirically investigated three documentation philosophies for new framework users, and discovered some guidelines for effective framework documentation, particularly in a Rapid Application Development environment. It is also found that different documentation styles are better for different goals. The article examined whether market orientation contributes both to the economic and non-economic business performance. For this purpose, a major survey of 120 consumer goods manufacturing companies in Bangladesh was undertaken. Two respondents, one from marketing and one from a non-marketing department, were interviewed from each company and a total number of 216 usable questionnaires were received. In order to seek answer to the research question, MANOVA was used to analyse the data. The findings showed that market orientation has a significant effect on both economic and non-economic business performance. increased customer satisfaction. In today’s highly competitive environment, banking sector in developing world must embrace the fast pace ICT, even in order to be sustainable. Based on this concept, this study has focused on the extension and further possible developments of the ICT oriented new systems to provide high stability as well as high security levels in both local and multinational banking systems in Bangladesh. The study took the initiative to explore the present situation of ICT in banking sector and to determine the gaps between these electronic / digital services given by the local and the multinationals in Bangladesh with an eye to generate alternate strategies for the locals to compete with the giants to retain and increase their customers. The study investigated that most of the new generation banks are almost ready to embrace the latest technology and there is a very wide opportunities for the local vendors. The study suggests that the modest growth in our banking sector can be achieved to a great extent by implementing ICT, not for maintaining latest trend or fashion; but for creating competitive edges of the era. Academic literature suggests that the dual listing announcements should have significant positive impact on the shareholders’ value, as trading of stocks at more that one location would reduce the liquidity risk with increases of stock trading volume. This study has been conducted to find out the effect of dual listing announcement on the share holders’ value based 156 companies that were listed with the Dhaka Stock Exchange and subsequently listed on the Chittagong Stock Exchange. Using the market adjusted abnormal return, cumulative abnormal return and trade volume changes before and after the dual listing announcement, we have tried to find out the effect of dual listings. Empirical results however do not support the conjecture that dual listing has any positive effect on the shareholders value in Bangladeshi capital market. The present paper looks at the claims in Bangladeshi advertising to find the elements of vagueness they possess. The paper builds upon the essay of Jeffrey Schrank (1949 – 1994) entitled “The Language of Advertising Claims” and analyzes some advertisements in Bangladesh where similar claims are made. The paper observes that the advertising copywriters in Bangladesh come up with some claims that very subtly fall between truth and falsehood. As there is no regulation in Bangladesh to monitor these claims, it is difficult to find a clear distinction between deceptive advertisements and ethically acceptable advertisements. This paper presents an empirical investigation of aggregate consumption tilting behavior in small open economies. In a standard infinite-horizon model of international borrowing and lending, we assume that agents smooth consumption over time through trade of foreign assets. This modeling approach allows us to show that the current account balance of the economy is a predictor of future changes in national cash flow. Economic agents, therefore, consume either more or less than current permanent cash flow depending on the observed current account balance. This can be referred to as agents’ aggregate consumption tilting behavior. We propose a simple econometric method of computing an un-weighted average measure of this consumption tilting behavior, and investigate this method for a class of small open economies. In light of the practical constraints associated with public tertiary educational activities in Bangladesh, a number of private universities have entered the new industry of private higher education of the country. The number of these private universities has been growing at a remarkable rate over the years creating a wider scope for the customers to choose among many options in consideration of quality. 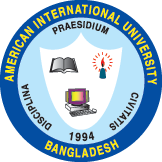 Keeping this observation in mind, this study adopts ‘external [peer group] evaluation procedure’ as a continuation of the previous study based on the ‘internal review procedure [ie, self-assessment] where American International University – Bangladesh was chosen as a case to study for logical reasons. This study conducts an empirical observation on the quality deployment state of private universities of Bangladesh. The research starts with identification of ‘quality function deployment [QFD]’ factors followed by an empirical assessment of the private universities through customer survey. The study ends with a suggestive discussion on the deployment strategy of the private universities. In this process, the study finally suggests for deployment of resources in certain areas such as establishment of permanent campus, credit transfer facilities, financial assistances to students, consulting hours for students, co-curricular activities, placement assistance and career development alumni, etc. Following a deductive approach, the findings of this study may be generally applied to university-specific cases – the universities which would require deployment of resources to overcome the above-said quality attributes. For greater empirical accuracy, the findings in this study, in many cases, are compared with those in Mamun and Jesmin  which is believed to be a pioneering work in the context of Bangladesh.